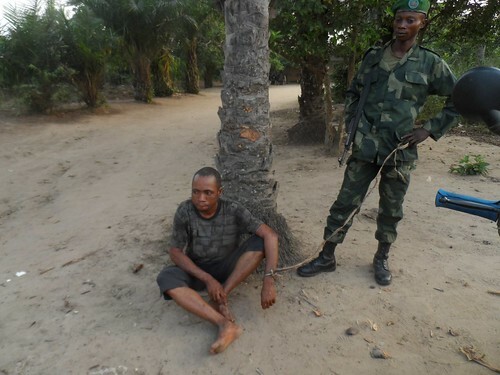 Arrested and on his way to Kindu. No escape possible. It was on 1st July 2015 that Asanga Gilbert brought four dead bonobos into Likanjo, the hunters’ village that has cankered up on the west side of Bafundo. 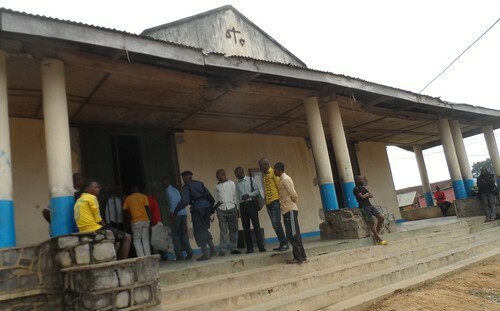 A PALL1 informer sent a message by HMS radio to Leon in Kindu. “You should be here,” is all she said. 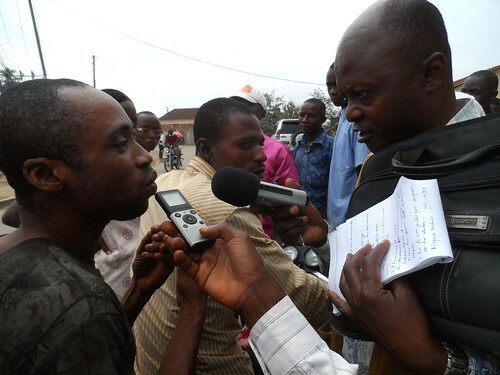 Leon informed the TL2 camp leader in Bafundo, by satellite Thuraya, to talk to the informer. 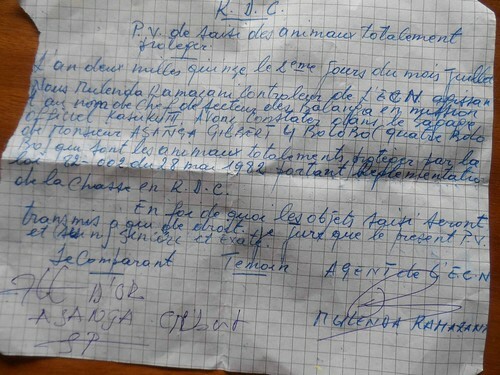 Leon also sent a message to Major Salumu, head officer of the army unit in Bafundo, “There might be need for an operation.” Then Leon took off by motorbike to join them. Restaurant as in the center of Likanjo. The informer ran a little path-side restaurant in Likanjo. Sprightly and social she had found out quickly after Asanga arrived from the forest with loads of meat. 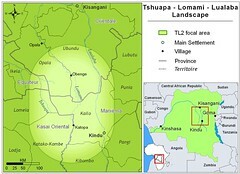 He came from the path that traverses the Lomami National Park. Some of his meat was in completely closed sacks – possibly protected species – and he preferred to sell them immediately – local restaurants were fine. 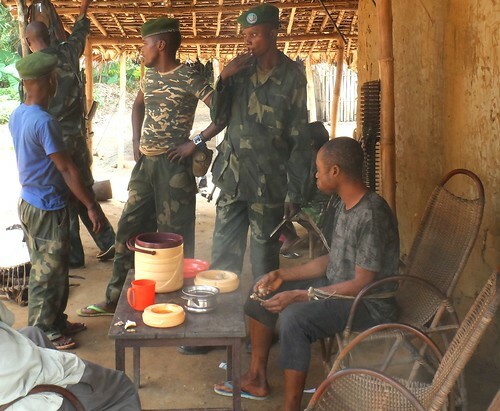 A Military in Bafundo reads the TL2/Lukuru protected species handout. 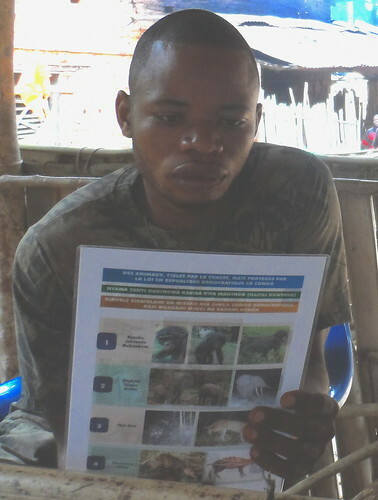 Over the last few years the TL2 teams distributed plenty of plasticized-picture printouts in Likanjo and Bafundo –everyone knows the totally protected species, species that cannot be killed anytime, anywhere –bonobo among them. When Leon arrived the next day at 11 o’clock Asanga was already arrested. 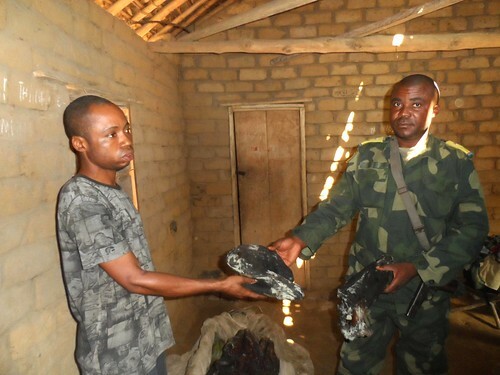 Asanga handing over the bonobo bushmeat to Major Salumu. It was the closed hunting season (but only the first day); he was coming from the park (but could anyone prove he had not hunted in forest outside the park? ); But in his packs the four bonobos had been discovered, cut up and thoroughly dried. 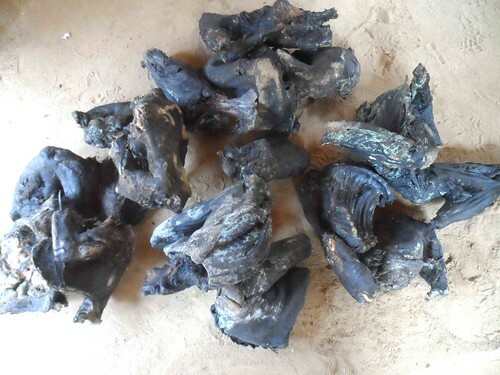 Bonobo bushmeat smoked, dried and covered in bugali flour from the sack in which it was enclosed. If justice moved as it did several years ago, Asanga would now be back in the forest with his 12-caliber shotgun. He might have spent a few months in jail and certainly he would have lost all of his game from the ill-fated 2015 hunting trip. A few years ago that was punishment enough, but it was not enough of a deterrent. The remaining hands and feet. The rest probably eaten along the way by the hunter. Bonobo were still being caught and sold. Next time a hunter came on a chattering group of bonobos in late afternoon hours, what would make him think twice? What example would make him shake his head and keep on moving? It would be easy to know where they chose to build their night nests. It would be easy to be there in the pre-dawn hours. And easy to bag two, three, even four like Asanga had. 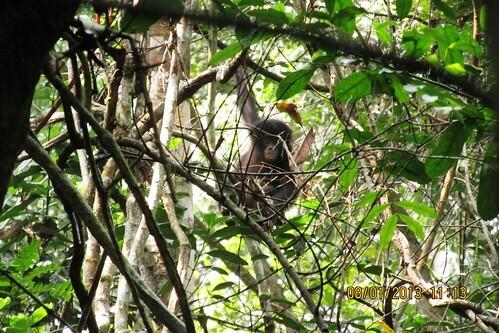 A curious bonobo peers through the foliage of the Lomami National Park at a passing TL2 team. He is surrounded by a much larger and vocal group. 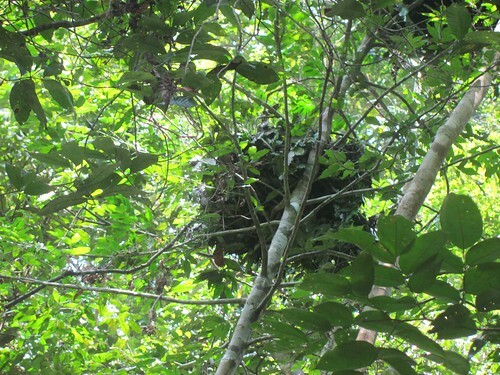 In the evening they will make a group of nests like this one and pass the night close together. The Major examined the loads. The Environmental officer wrote a PV (Proces Verbal). 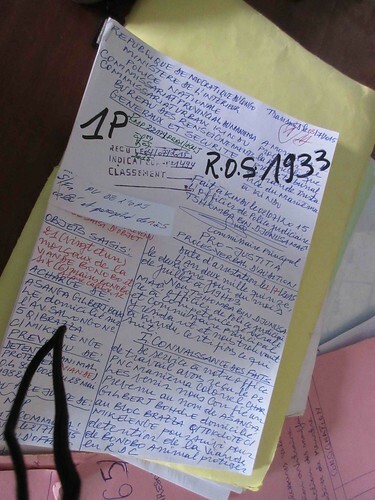 It was duly signed even if only on paper torn from the ubiquitous school children’s “cahiers” or exercise notebooks. 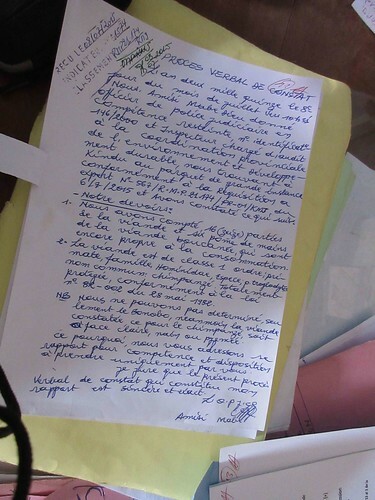 The PV or “proof of evidence” written by the state environmental officer in Bafundo. But where was the humor? After all bonobos were just animals – it was just meat. It would not have surprised Asanga if all his meat was taken away; the army could do that. They would use a law to confiscate, then eat the meat and let the hunter go. 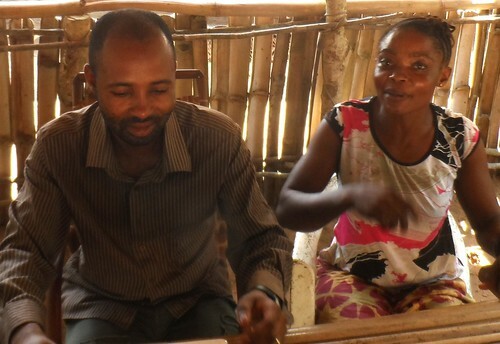 Asanga has a last meal in relative freedom before being taken to Kindu. But this went much farther. 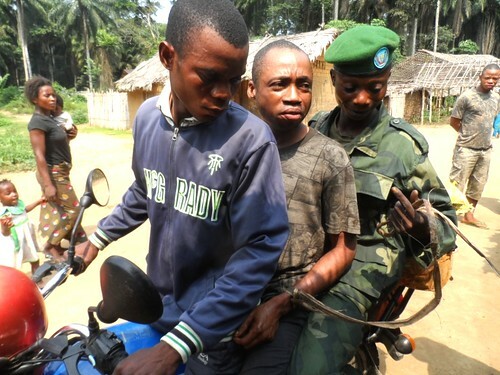 A motorcycle was rented to carry Asanga to Kindu and another with the dried bonobos. A military sat behind Asanga and was responsible for staying with him step for step the whole way. Instead of gaining from his confiscated bushmeat, money was being spent to send him and a few dead bonobos to Kindu. Five hours on motorbike…120 km one-way. 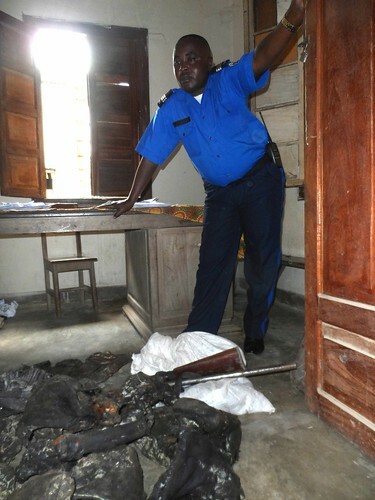 A judicial officer of the police received Asanga’s bonobo bushmeat and shotgun in Kindu. 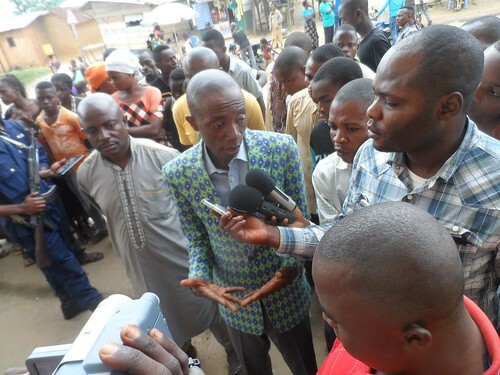 The next day in Kindu there was a press event. It was not only the OPJ of the police, but also the Minister of the environment and the head warden of the Lomami National Park. The Minister with the Head warden beside him speaks at the press event. Asanga was given the chance to speak to the press. Then for a whole year justice marched through its slow process and Asanga served a first entire year in prison. 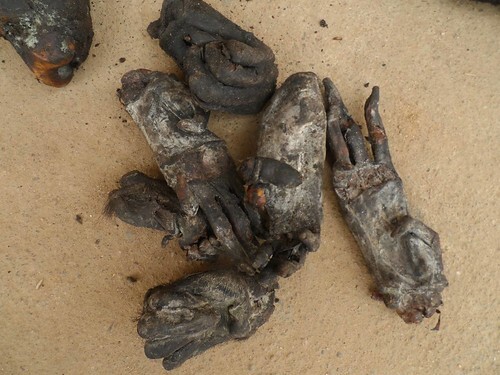 The bushmeat evidence is hauled into court. This is how it happened. Instead of allowing the case to disappear and sort itself in an “informal” manner, a lawyer, Willy Ali, followed it step by step. Document by document. 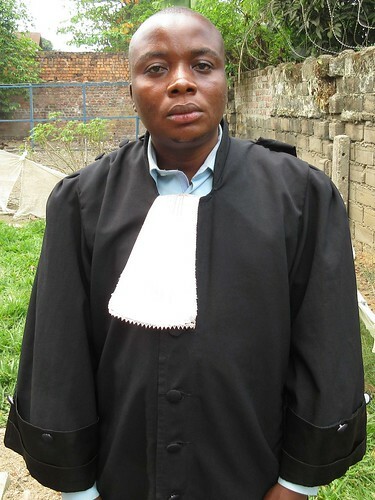 Willy Ali is the lawyer who followed the case through the court. First step – the meat was inspected by a state expert and proclaimed to be great ape – totally protected. Asanga was duly registered. Who was he? He was a Mulanga, and he was hunting in the Balanga forests, BUT his residence is in Kindu. He was hunting the forests of his brothers to sustain his city life. 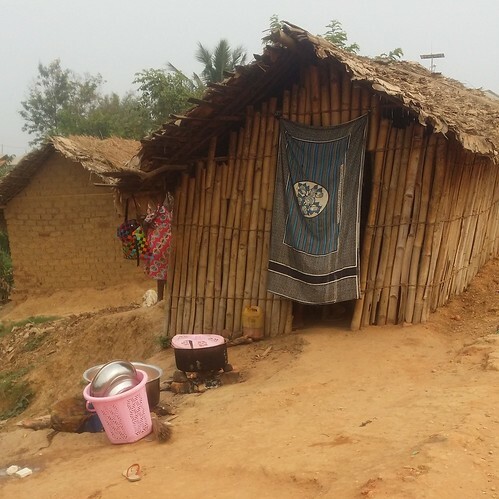 The court document recorded the official residence of Asanga. It is in Kindu. The judgement has been given (26 August 2016) and Asanga has another 9 years to serve. For Kindu this is unprecedented recognition of the importance of bonobo. It is tempting to feel sorry for Asanga. We do. Why must there always be a scapegoat? Is it a necessary step to save the bonobos in the Balanga forest? We believe that it is. The former informer with the TL2 program manager, Matthieu. And the truly courageous one in this event was the informer. She went out of her way to contact PALL. She was spurned and castigated as a result. All of Likanjo lives off the hunters. She and her husband have left Likanjo; we continue to communicate with her. This entry was written by Terese Hart, posted on 2016-09-01 at 12:37 pm, filed under Bonobo, Bushmeat. Bookmark the permalink. Follow any comments here with the RSS feed for this post. Trackbacks are closed, but you can post a comment. Good to see justice served for poaching endangered species. People must know there will be consequences for this, especially in the park. Great coverage, as always, Terese. A thoroughly intriguing story. I feel no sympathy for Assanga. His example will resonate deeply, and the severest penalties are entirely appropriate. I’m South African. I write from New York, where I live, and recently found your site. I am engaged in a long-term project to illustrate all the endangered species on land and in the oceans. Each illustration is accompanied by a very short story. You may see the first few examples, and their proposal, on the first page of my website. I have completed the bonobo drawing, and am working on the short story so as yet it is not included. I just secured a literary agent and we hope to sell the first book to a publisher within months. Perhaps 20 illustrations for the first in what will be a series of books. I encourage you to read my rationale for approaching it in the way I have. I am now a regular visitor to your site, and congratulate you on you outstanding efforts.